We get it. The idea of getting a custom built PC online is one that a lot of people didn’t even know was possible. Even if you were aware of it, you might think you don’t know enough about PCs to customise one yourself. Well, we’re doing our best to raise awareness but this is a slow and costly process. On the other hand though, we’ve already made it super easy. Let me explain. At first glance, customising a PC on our website can be a little daunting. There’s a lot of options and you might not know where to begin. Let us guide you! All the options will start to make sense. On our home page you’ll be presented with 2 main options for custom PCs. There’s Gaming, or Home & Business. Click into the one that’s right for you. Next you’ll get a list of three to four base configurations, each with a short one paragraph explanation detailing the differences. You can give these a quick read, decide which sounds the closest match to your needs, then go ahead and click into it. Here is were the real confusion can begin. Some nice long lists of all the possible hardware options for each component. Motherboards, CPUs, RAM, graphics cards, storage drives… The list seems endless and for those not too savvy with PC hardware, you might not know what you’re looking at! Well, take a big deep breath and stay calm, it’s not really that difficult. As everyone’s exact use cases, budgets, and requirements will differ, it’s hard to make a definitive ‘one size fits all’ guide. But there are some basics tips we can provide that will give you plenty to get started. Understanding a few basic PC hardware terms. Have a very specific use case and want a tailor made configuration by experts? Reach out to us and let us know the details for an obligation free quote! Spending thousands on a brand new PC is great! But not having any space left in your budget for an equally high-end monitor, mouse, and keyboard can limit the system’s potential and impact your experience as the user. 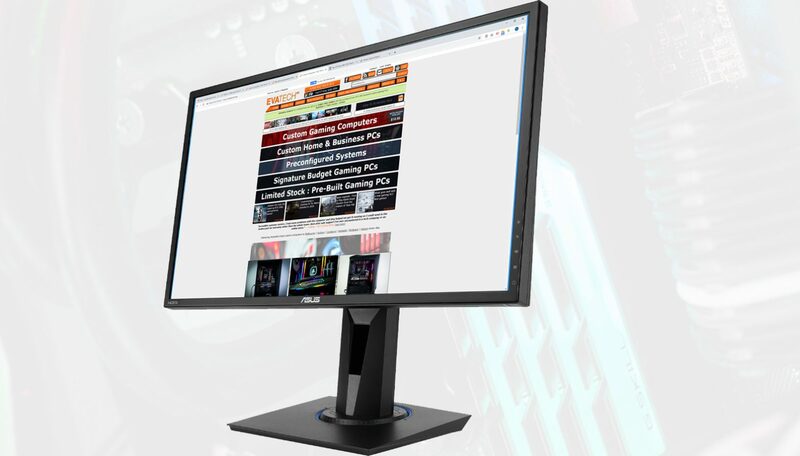 Take a look at our range of monitors and peripherals to get an understanding of much of your budget you should set aside when customising your PC. Now with all that in mind, you are ready to get started. Keep an eye out for our built in tips at the top of certain component selection categories. These are designed to assist you in making the appropriate choice. Please read them carefully if you’re unsure what options will suit you best. We also have built in compatibility checking that will highlight potential issues with selected options. These will be highlighted in red. So if you don’t see any big red markers on the page, rest assured your selections are compatible. Last but not least, our team of hardware professionals will carefully cross check all orders. This makes sure each configuration is well optimised and doesn’t contain any potential hardware conflicts. In the rare occasion they do, we’ll reach out to you to let you know and help you make any necessary adjustments. Know that it is near impossible for us to build, test, and dispatch a PC that isn’t compatible. So there’s a zero percent chance you’ll get a PC that doesn’t work. I’ve got a configuration I’m happy with, now what? Once you’ve got all your component selections finalised, hit ‘Save & Continue’ on the right (desktop only) or bottom of the page. Your unique configuration will get permanently stored in our database and assigned a 6 digit custom PC ID number along side a summary of the configuration. You can use this number to recall this exact configuration at any time. Simply enter this 6 digit PC ID number in the input box titled ‘Enter PC ID Number Here’ and click the ‘Load’ button. You can also quote this ID to any of our staff members if you wish to discuss it further. If you wish to make alternations to a custom PC configuration you can simply load up the PC ID number and click the ‘Customise’ button. Note that after making changes and clicking ‘Save & Continue’ you’ll be issued a new PC ID number. Don’t worry, your previous configuration is preserved under the old PC ID. Once you’re ready to lock in an order it’s as easy as hitting the ‘Add to Cart’ button and proceeding through checkout. Don’t forget to add any monitors, keyboards, mice, headsets, or other accessories you might need for your new custom PC. The entire process is quick, easy, safe, and secure. We accept multiple payment methods including PayPal, Visa & MasterCard, Zip, 120 day layby, and bank deposit for your convince. Custom PC assembly begins as soon as payment clears and all systems undergo a series of meticulous cross checks and burn in testing prior to dispatch to ensure the highest possible levels of quality control. Desktop computers, unlike phones, laptops, TVs, gaming consoles, or other high tech high cost household gadgets can be built from a huge range of possible components. Take shopping for smartphone for example: a process that typically involves identifying the handful of options in your budget and comparing them. Making a compromise between aspects like battery life, screen size, storage capacity, and camera quality to get the right one for you. Sadly this is how a lot of people (who shop at places like JB Hi-Fi, Officeworks, or Harvey Norman) would handle shopping for a desktop PC too! However unlike a phone or TV, a computer can be tailor built to your exact needs. You don’t have to pay extra for parts you don’t need or would never use. You can choose from a huge range of aesthetic combinations to suit your exact style. Furthermore, it can be custom built to order for you right here in Australia. Not to mention when you go with a completely custom Evatech PC you’ll save hundreds (if not thousands!) of dollars. You’ll get warranty and support from a local team of experts who speak your language and actually know what they are talking about, and you’re guaranteed top shelf latest generation hardware! That last one is important. Often ‘big box’ retailers will be attempting to offload old previous generation products at full price to unsuspecting customers. More on that in upcoming posts!